Welcome to my “living” review/preview of the Swiftech MCP 655-PWM DRIVE. What do you get when you couple our most reliable, most silent, and most cool running pump with PWM technology? A Swiftech MCP 655 PWM-DRIVE! I have been using D5 variants for about 5 years now and have always admired them as probably being the most tried and true pump out there serving many systems for 5 years + and going strong. However, I have also recently come to admire having PWM control over pumps such as the Swiftech MCP-35X in which I was able to automatically speed up and slow down the pump to meet thermal demands. PWM is also of value for special reservoir tops and other cramped installations where manually getting to the pump speed control is difficult after installation. With the added PWM features, you no longer need to touch the pump physically to change speeds and you now have the flexibility to control it manually or automatically through a variety of PWM controlling software. A special thanks to Mark from Frozen CPU for sponsoring the pump used in this review. The pump is completely plug-and-play, and connects directly to any computer power-supply through standard 4 pin power connectors and a PWM 4-Pin header. It’s compact design, quiet and powerful motor make it ideally suited for heavy duty cooling in environments where space is at a premium. This pump comes stock without any housing allowing you to integrate any of your favorite pump tops and pump accessories. So, the hydraulic specs appear to be the same as the MCP 655, however there are some minor differences in the nominal power rating of 37W and operating voltage. The 13ft of maximum head is right in line with what I have measured myself with other D5 variants, but power consumption for my test bench has typically toped out around 21 watts or so depending on restriction. We’ll have to put it through the ringer of tests and see how it compares. 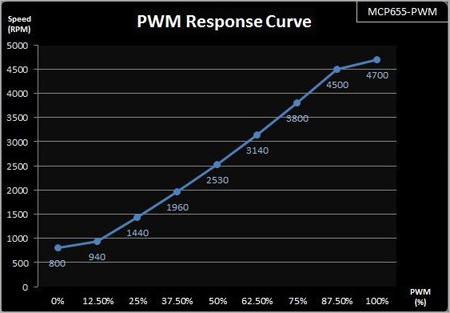 Perhaps there are some differences in RPM scaling over the vario model and perhaps the PWM feature allows a greater range of RPM operation.